I noticed some of my koi fingers have black speckling on sclera portion of eye. 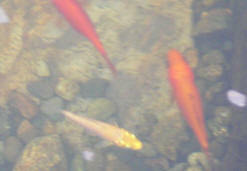 Most fish look affected but show no signs of distress (flashing or similar behavior) or deaths. 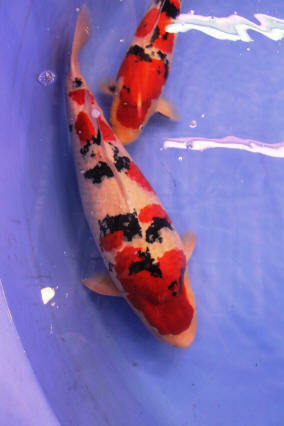 This line of koi does develop a fair amount of black pigments on skin. Hoping this isn't a fluke or similar parasite. The tanks are well established tanks connected to aquaponic grow beds, nitrates rarely creep over 10ppm and NO-2 and NO-3 are zero. We are on a "hard" water supply. I do have access to a microscope... Any advice would be greatly appreciated. We've created a website, http://nextdaykoi.com , that we think could offer your audience an additional resource for information about Koi. With all of our great resources and products available to complement yours, we thought that by sharing our site with your audience (or by adding it to the resources/links section of your website, http://www.wetwebmedia.com/pondsubwebindex/pdfshbreefaqs.htm ). you can boost your site's already robust content. 2 Comments (all around 3") and 2 goldfish (2"). A friend is doing away with a pond she has inherited with her new house. 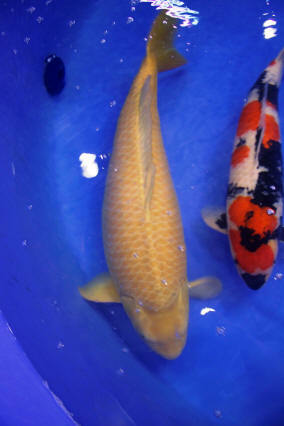 She wants to rehome the Koi carp. The original owner says there are more, but she has only seen one surface. She says it's about 10". Would it be safe to put it and poss. more of a similar size in the pond with my fish? I have read they eat fish small enough to fit in their mouths, but not sure how small this is.